In this madcap adventure, a brother and sister find themselves in the underground hospital for magical creatures where they must save the lives of millions of magical creatures . . . and themselves. Deep below ground, there is a secret hospital for magical creatures. 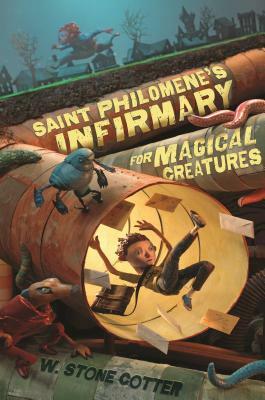 At Saint Philomene's Infirmary, all creatures are welcome—except humans. So when twelve-year-old human boy Chance Jeopard unearths a plot to destroy the hospital and its millions of resident patients, he is launched into the role of unlikely—and unwelcome—hero. His infinitely pragmatic and skeptical sister, Pauline, thinks it's all nonsense until she finds herself swept up in the mission. It will take all their wit and courage for the brother and sister to save Saint Philomene's—and escape alive! W. Stone Cotter is a new talent in middle-grade fiction. He has previously published his essays and short fiction in The Believer, Lucky Peach, The Paris Review, McSweeney’s Quarterly, and The New York Times, and in 2013, he was a recipient of the Pushcart Prize. He lives in Austin, Texas.